Last month, Reynolds students Karina Gonzalez and Jarrette Werk both attended conferences in Miami, Florida. 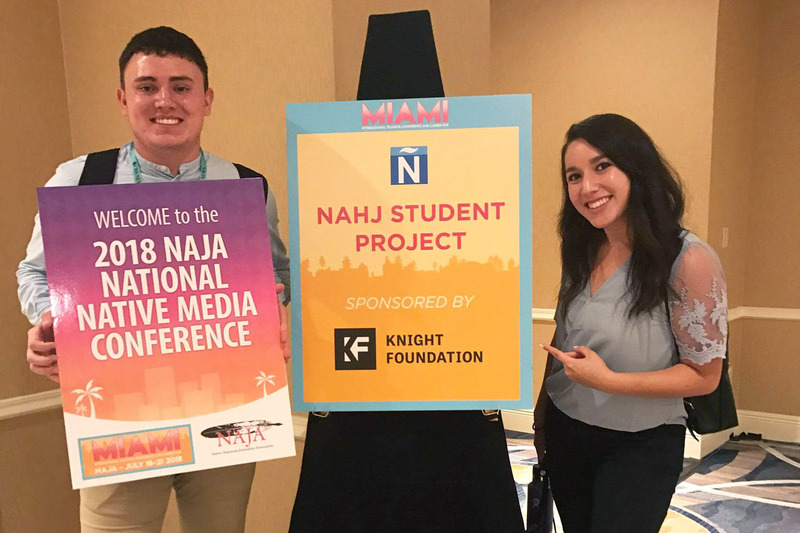 Gonzalez was selected for the National Association of Hispanic Journalists (NAHJ) Student Project, while Werk was selected as a journalism fellow and newsroom leader with the Native American Journalists Association (NAJA). Werk, who attended the NAJA conference last year in Anaheim, was a second-year fellow in Miami this year. While at the conference, he took over the Reynolds School Instagram story and gave students an inside look at the NAJA newsroom. 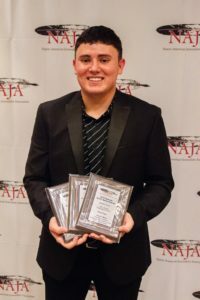 Jarrette Werk poses with three awards he received at the 2018 Native American Journalists Media Awards. While at the conference, Werk won three awards at the 2018 Native American Journalists Media Awards: first place for Best Feature Photo, second place for Best Sports Story and honorable mention for Best News Story. Meanwhile, in Gonzalez’s newsroom at the NAHJ conference, the student journalists were busy producing three stories under deadline with mentors in the field. Gonzalez produced stories about a NAHJ mentor driving from Houston to Miami for the conference, a Los Angeles Times reporter being chastised for speaking Spanish to her daughter and a Cuban dancer and recording artist working in Miami. 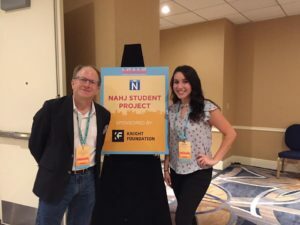 Dean Alan Stavitsky (left) joins Karina Gonzalez (right) at the National Association of Hispanic Journalists conference in Miami. As career expos and workshops were going on at the conference, Gonzalez was furiously typing, editing her mini-documentary and reporting out in the field. Although she didn’t get a chance to walk around the career expo booths, she didn’t miss her shot at networking, since recruiters from publications such as the Washington Post and AP came into the newsroom. Getting this newsroom experience and sharing stories that promoted the Latino voice helped Gonzalez realize her calling. Before attending the conference, Gonzalez wasn’t sure if she’d be selected. After attending the conference, she has a new-found confidence and outlook on applying to other programs and opportunities and urges young journalists to follow her lead. So you think you can get a job? We've got some tips to help your chances.